ALL SEASON SAVINGS!! Up to $200 off a set of tires! 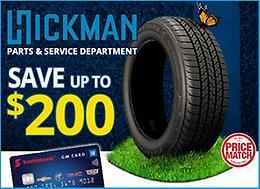 INCREDIBLE ALL SEASON SAVINGS Get up to $200 off for All Season tires when purchasing with a Scotiabank GM Visa card! "Adventure Ready Package” starting at $109.95: Multi-point health check, full break insopection, tire rotation and more! Click here for details and to book your appointment today!